Fun With Numbers is a non-adventure game. 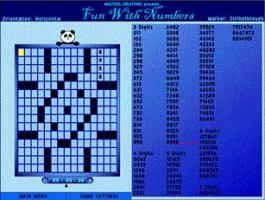 It is a fill-in cross numbers type of puzzle. Randomly generated puzzle allows you to play as many as you want. Save it, print it, and play it anytime you want!! A must for fill-in cross number type of puzzle fans. "Does what it says on the tin. Graphics functional, though uninspired. Overall enjoyment level based on your appreciation of this type of game." A good puzzle game, which is easy enough to be enjoyable yet gives some nice challenge to our brain. As another reviewer said, music can get a bit boring after a while, but that doesn't ruin the gameplay. If you like sodoku-esque teasers, here's a good one for you! Thanks a lot for your feedback..
Nicely realised little cross numbers game. I completed one grid to "see", was okay. Nice game anyway, if you like this kind.